Ask Mr. U is an interactive story about a man and his wife. 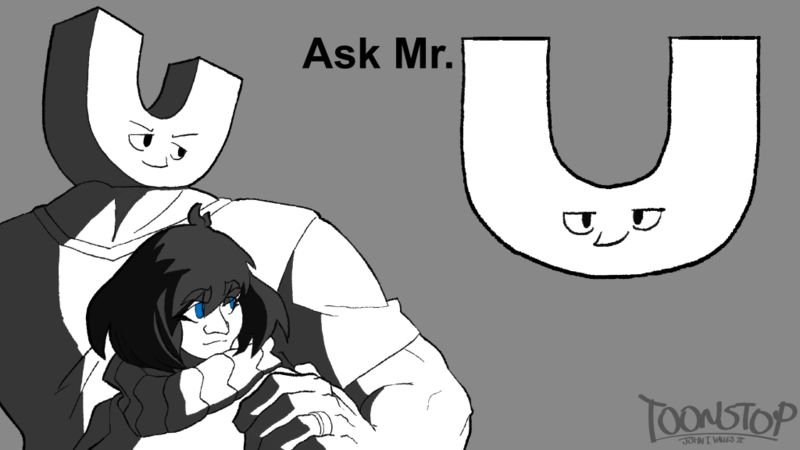 The concept for Ask Mr. U started with a drawing I made for a friend to encourage him when he was having a rough time during college. (“Believe in the U that believes in you.”) After that I couldn’t help taking it a bit further than a one-off joke. Ask Mr. U was created to foster community by telling a story that the readers don’t just consume, but get to be part of. Readers write in with questions that either help drive the story or create jokes. The story started back in 2015 and was an off and on affair as far as publication goes. Frankly speaking, I never got as far as I needed to as a writer and editor to make the story a regularly-published reality. All the same, Ask Mr. U has a story that I would love to finish, and soon. I love these characters, and I want to get back to sharing them with the other people who fell in love with them. You can click the image above or go right here to read every page of Ask Mr. U published so far.